F.O.L.D. BOOK BASH was terrific – Check out the amazing and diverse authors, poets and publishers I met on Saturday. Today at City Hall in Brampton, Ontario, Canada, FOLD hosted the 2017 Book Bash. WHAT IS A FOLD BOOK BASH? A one-day book market designed to give authors and book selling organizations a space to promote their books. As well as the chance to listen to authors read from, and talk about their books. FOLD is the first and only literary festival in Canada to focus on diverse authors and stories. The first Festival of Literary Diversity was held in May 2016 and included more than 25 unique sessions held over three days with over thirty of Canada’s most exciting authors. Mark your calendars for May 3rd to May 5th, 2018 for the next Festival. There will be quite a few authors and publishers with many different sessions to choose from. CHECK IT OUT – YOU’LL BE GLAD YOU DID. Jael Richardson is one busy woman. Besides being the Founder and Creative Art Director of the Festival of Literary Diversity, she is also an author in her own right. 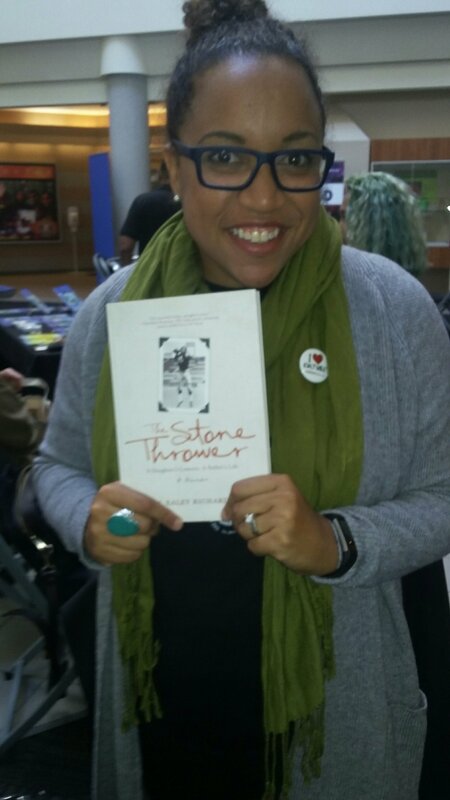 Her book THE STONE THROWER: A DAUGHTER’S LESSON, A FATHER’S LIFE is a memoir based on her relationship with her father, CFL quarterback Chuck Ealey. 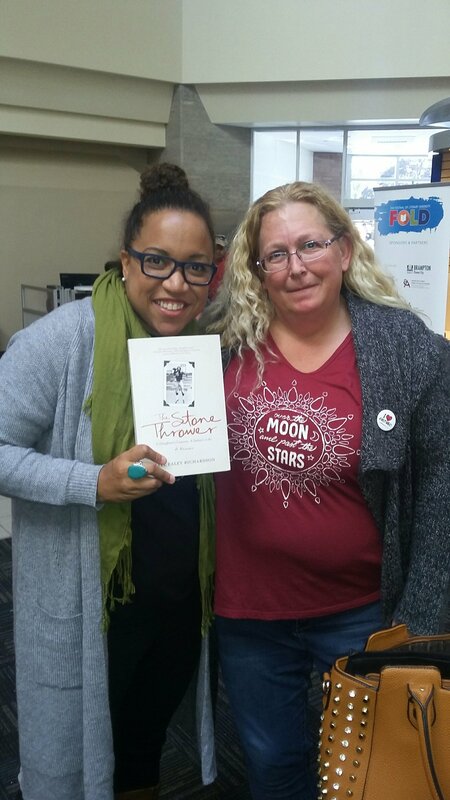 The memoir received a CBC Bookie Award and earned Richardson an Acclaim Award and a My People Award as an Emerging Artist and was adapted into a children’s book in 2016. DEJA BEALS has been writing poetry since the age of sixteen. She finds her inspiration for her poetry in family, friends and everyday experiences. developed. Her work has blossomed to include a range of topics such as love, faith and everyday experiences. Déja finds her poetic inspiration in family, friends and her daily experiences. She is known for her silly moments, big laugh and even bigger heart. She has been said to have wisdom beyond her years and uncanny insight which adds depth to her writing. She is currently living in Toronto, Ontario, Canada. 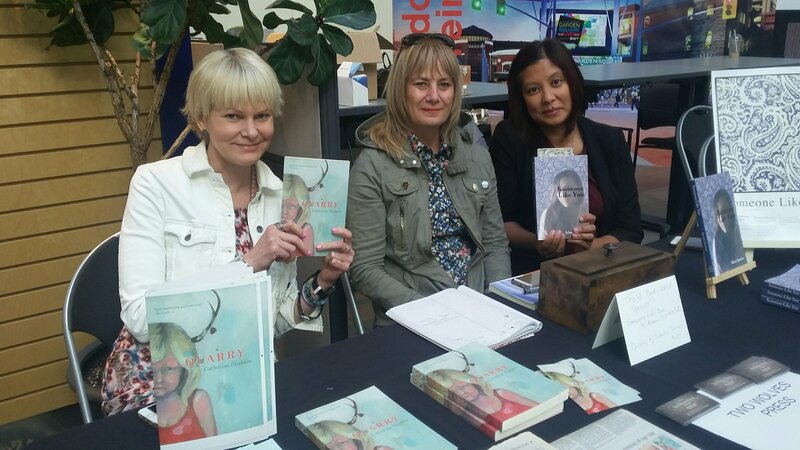 I met these three very gracious and amazing women at the FOLD Brampton Book Bash. About the multitalented Catherine Graham – Not only has she written the fiction novel QUARRY but she is also only days away from the launch off her new poetry collection THE CELERY FOREST which is being published by Wolsak and Wynn. QUARRY is a fictional story set in Southern Ontario during the 1980s. Only child Caitlin Maharg lives with her parents beside a water-filled limestone quarry, but her idyllic upbringing collapses when she learns her mother is dying. After a series of family secrets emerge, Caitlin must confront the past and face her uncertain future. Like Wonderland or Oz, Neverland or Narnia, The Celery Forest is an extraordinary world filled with strange creatures and disorienting sights. But the doorway to the Celery Forest is not a rabbit hole or an old wardrobe. The doorway is an MRI. For poet and novelist Catherine Graham, this is the topsy-turvy world she found herself in after learning she had breast cancer. More than a survivor’s tale, these poems are a map through unknowable terrain, infused with awareness and forgetting, written by a poet with the visionary ability to distill our sense of wonder into something we can hold. CEO and Founder of Two Wolves Press, Alexandra Leggat is the author of the novel The Incomparables as well as several other published works. Alexandra started Two Wolves Press as a way to nurture talent without compromise – to work closely with Two Wolves writers to follow and trust their intuition and publish “instinctual fiction”. Aileen Santos’ SOMEONE LIKE YOU. MORE INFO COMING IN MY NEXT BLOG POST.